The Edmonton Oilers have become the first hockey team to show off the rainbow adhesive in support of diversity. A hockey team has found a colorful way to show support for the LGBT community. 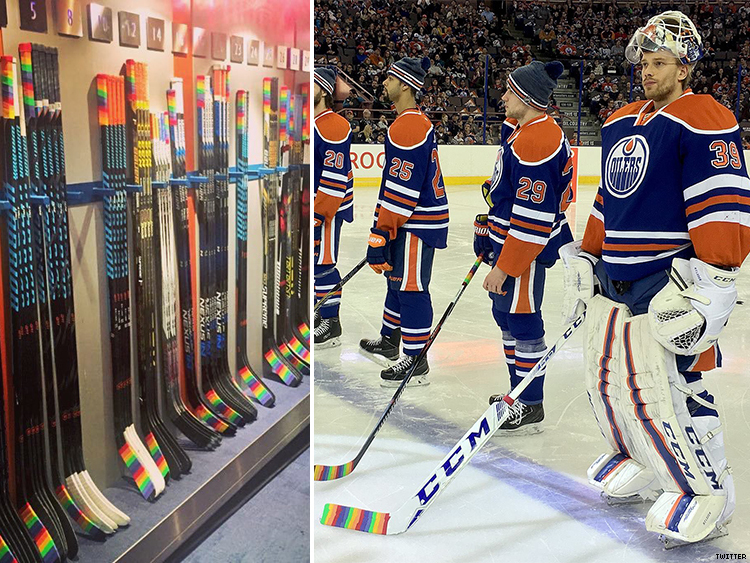 The Edmonton Oilers have wrapped their hockey sticks in Pride Tape, a rainbow adhesive that shows their commitment to inclusivity in sports. The Canadian team is the first of the National Hockey League to show off the tape, which it debuted Sunday at its annual Skills Competition. A photo of the multihued equipment was posted to Twitter right before the sold-out show. The Edmonton Oilers Community Foundation, which supports the health, wellness, and education of young people, has donated funds to become a founding partner of Pride Tape. It joins organizations like the Sexual Minority Studies and Services at the University of Alberta in the initiative. "We are thrilled to be partnering with the Oilers and officially launching Pride Tape in Edmonton, a city that believes in diversity and human rights, and a city that proudly supports our LGBTQ community," said Dr. Kristopher Wells, a director of the institute. "It's a local initiative with national reach and we're very excited to have the Oilers be the first to support this inclusive message on the ice." Proceeds from Pride Tape will benefit the institute as well as You Can Play, a group that promotes LGBT inclusivity in sports. The groups have partnered with Calder Bateman Communication to launch a Kickstarter page, which is raising funds to make the first 10,000 rolls of Pride Tape. As of this article’s publishing, the campaign has raised $37,859, less than $2,000 shy of its goal.